PLEASE SHARE YOUR THOUGHTS ON THIS SITE AND ANY SUGGESTIONS BY SENDING AN E-MAIL. THANKS! Let us start by being honest. 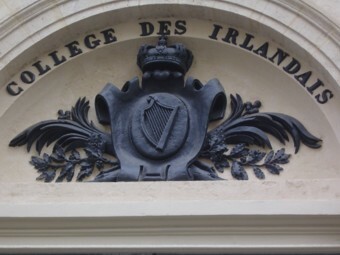 Despite the refurbishment of the Irish College in Paris a few years ago and its transformation into a cultural centre, the Irish today have only a small place on the Paris scene and the impact of the Parisian Irish on affairs back home is even smaller. But it was not always so. Up to the 19th century, Anglo-French rivalry meant that Paris was an obvious haven for political refugees from British rule and for the Catholic élite prevented from completing their education at home. Before setting up in the rue des Irlandais, Louis XIV even granted the Irish the right to establish their own seminary at the Collège des Lombards in the rue des Carmes (5th arrondissement). But even as Paris began to assume its historical role as a centre for political dissidents from around the world, including Ireland, France's relative decline meant that Paris became steadily less relevant to the Irish from the early 19th century on. Catholic Emancipation and the opening of Catholic universities in Ireland were another reason for a weakening of bonds. Last but not least, the spread of the English language in Ireland and the wider world meant that Irish exiles were more inclined to emigrate to the U.S., Australia and Canada, as well as Britain, rather than to France. By the early 1930s, when Eamon De Valera asked the Irish minister plenipotentiary in Paris, the mercurial Count Gerald O'Kelly de Gallagh, what the French thought of the Irish, O'Kelly de Gallagh was able to reply that "They do not even notice that we are there." The remark is said to have curtailed O'Kelly de Gallagh's career in the diplomatic service, but his assessment of Franco-Irish relations was probably not very wide of the mark. And yet, the Irish have always been coming to Paris for reasons other than tourism. Throughout the 19th and 20th century, a steady trickle of colourful figures continued to be drawn to the French capital. Some ended up there by chance, and others who came for a short stay found themselves staying longer than they first envisaged. Few made their fortune, but most at least avoided a violent end. research into the lives of strange and wonderful characters not featured here, such as: the Abbé MacMahon, chaplain of the Bastille when it was stormed in July 1789; the O'Callaghan family, whose crypt in the Père Lachaise cemetery is beside that of the better-known William Lawless; May Belfort (née Egan), a music-hall singer immortalised in publicity posters by Toulouse-Lautrec; Peter Dillon, a half-caste maritime adventurer who managed to discover what happened to a doomed French scientific expedition to the South Seas; and Mortimer Murphy, an eccentric and erudite language teacher mentioned by several Irish exiles of the latter part of the 19th century. Ach sin scéalta eile!